Director – Frederik Du Chau, Screenplay/Story – Joe Piscatella, Adam Rifkin & Craig A. Williams, Based on the TV Series Created by W. Watts Biggers, Producers – Gary Barber, Roger Birnbaum, Jonathan Glickman & Jay Polstein, Photography – David Eggby, Music – Randy Edelman, Visual Effects Supervisor – Hoyt Yeatman, Visual Effects – Cinesite (Europe) Ltd (Supervisor – Ben Shepherd), Custom Film Effects (Supervisor – Mark Dornfeld) & Framestore-CFC (Supervisor – Rob Duncan), Special Effects Supervisor – Paul Lombardi, Dog Puppets – K.N.B. EFX Group Inc (Supervisors – Howard Berger & Greg Nicotero), Production Design – Garreth Stover. Production Company – Spyglass Entertainment/Barber-Birnbaum/Jay Polstein/Classic Media. A beagle is thrown out of the police canine squad after calling a bomb alert over a pork chop in a parcel delivered to the mayor. The dog is taken for experimental use at the laboratory of diminutive genetic scientist Simon Barsinister. When Barsinister plans to inject the dog with a serum as part of his plans to create a super police dog, it flees, smashing up the laboratory. Chemicals spill over the dog and it is suddenly able to smash through the laboratory door. Outside, it is run over by the laboratory security guard Dan Unger, although is left undamaged. Dan takes the dog home, naming it Shoeshine. Dan’s teenage son Jack is amazed to discover that Shoeshine can talk. As he befriends it, Jack discovers that Shoeshine has a number of superpowers, including the ability to fly and move at super-speed as a result of the chemical spill. After Shoeshine apprehends several criminals, Jack decides to create a costume and make him a superhero, naming him Underdog. Underdog soon gains great fame with his crime-fighting exploits. However, a scheming Barsinister plots to stop Underdog. Underdog (1964-73) was a cartoon series that enjoyed reasonable success. 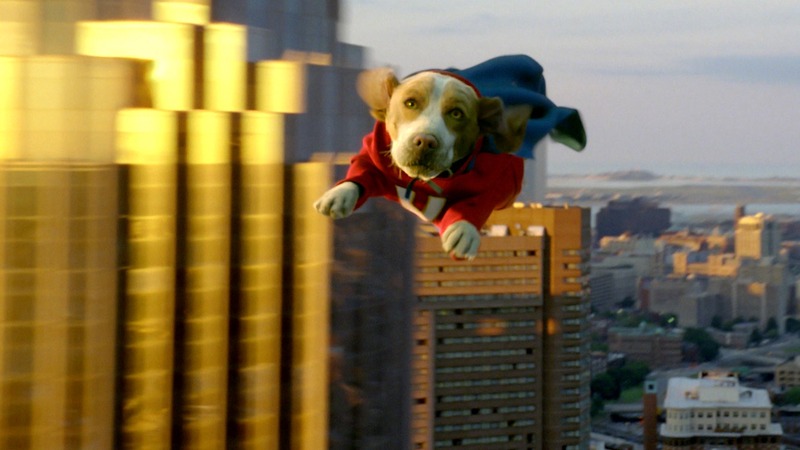 Underdog was a spoof of Superman – a dog that had relatively similar superpowers. Like Superman, Underdog also had a secret identity as the domestic pet Shoeshine Boy and was fancied by the canine journalist Polly Purebred, who he had to constantly save from trouble. The action was tongue-in-cheek – one of the weirder quirks about the show was that Underdog always spoke in rhyme. Underdog lasted for 124 episodes, although the number is somewhat misleading as these were usually fifteen minute serial-like segments that were interspersed in an hourly episode with at least two other cartoon shows. These have been shown in different combinations over the years. Now, Underdog joins a spate of cartoons shows that have been remade as live-action films in recent years. These have included the likes of The Flintstones (1994), George of the Jungle (1997), Mr Magoo (1997), Dudley Do-Right (1999), Inspector Gadget (1999), The Adventures of Rocky and Bullwinkle (2000), Josie and the Pussycats (2001), Scooby-Doo (2002), Fat Albert (2004), Alvin and the Chipmunks (2007), Transformers (2007), Speed Racer (2008), Dragonball: Evolution (2009), The Last Airbender (2010), Yogi Bear (2010), The Smurfs (2011) and Jem and the Holograms (2015). 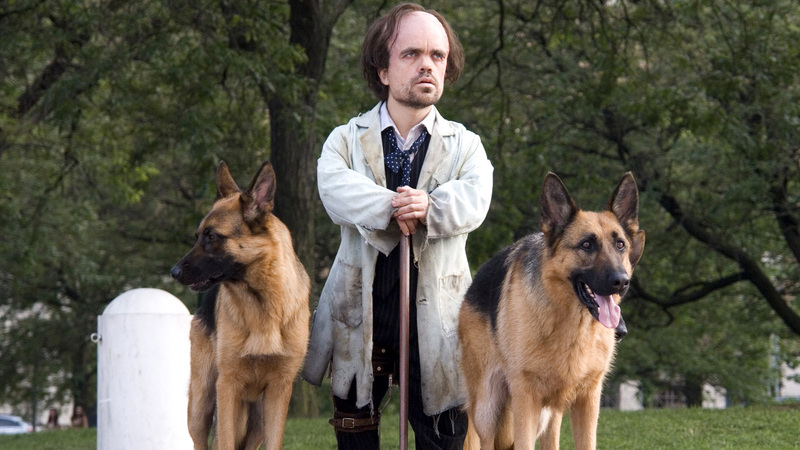 In the vein of Babe (1995), all the dog antics have been created via a mixture of animatronics and CGI. One sits down to watch Underdog with the memory of the excruciating live-action talking dog drama Good Boy! (2003) still firmly lodged in mind. You could also point to Krypto the Super Dog that appeared in Superman comics beginning in 1955 and has proven far more popular than such a lame idea might have suggested, including the recent animated tv series Krypto the Superdog (2005), which only lasted for one season. And then, of course, there was the legendary The Adventures of Superpup (1958), a never-screened pilot episode that attempted to spin out the popularity of tv’s Adventures of Superman (1952-8) following the death of George Reeves, by recasting the Superman story with talking dogs, which were played by midgets in animal masks. The other thing that had one gritting their teeth about Underdog was the presence of director Frederik Du Chau. The Belgian-born Du Chau started out as an animator, directing Quest for Camelot (1998) and then branching out into live-action with Racing Stripes (2005). Racing Stripes was an agonizing attempt to create another live-action talking animals film in the vein of Babe. Where Babe was a gently affecting fable, Racing Stripes ran everything over with lavatory humour, animals throwing in smartass one-liners and annoyingly intrusive pop culture reference gags. Expectedly, Frederik Du Chau turns Underdog into the same irritatingly hip, smartass talking animal fantasy. Like Racing Stripes, Underdog is a gag film where all that Du Chau seems able to do is create constant gags about Underdog tossing around couches, splattering the room when he bites through a can of dogfood or creating a mound of dirt three metres high when he digs a hole. There’s much slapstick almost every time we see Underdog in action – he cannoning through office blocks, snatching sandwiches along the way and then flying blind with the pickles across his eyes; dragging Patrick Warburton through the streets on the end of his leash; or k.o.ing muggers by tossing trash can lids. There is much excruciating smartass dialogue – he and Alex Neuberger exchange lines like “You know you never see dogs hurting each other”, “You never see people sniffing each other’s butts.” Upon seeing Shoeshine in a flea collar cone, Riff Raff jeers: “Let me guess, you went for satellite instead of cable.” Du Chau even throws in parodies of the romantic flight through the skies from Superman (1978) and the meatball eating scene from Disney’s Lady and the Tramp (1955). The problem with this is that none of it is the animated Underdog. The animated series, some of which is briefly screened at the start of the film, was a zany delight along the lines of other absurdist shows of the era like George of the Jungle (1967-70), Wacky Races (1968-70) and The Dudley Do-Right Show (1969-70). The original delighted in its absurdly po-faced heroics but what Frederik Du Chau has created is a far cry from that. Rather than the absurdist notion of a canine superhero, the film seems to greet the premise of the original by firing sarcastic asides at what is happening. What Underdog feels like is a film that is so caught up with trying to appeal to hip post-modern sensibilities and make its audiences laugh that it only ends up cynically deflating the original. Ultimately, all that Underdog the film ever arises to is a mawkish boy and his dog story shot through with a modern cynicism.